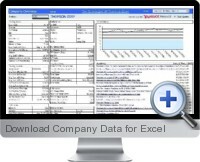 Download Company Data for Excel provides access to company snapshot data including stock quotes, price and volume history, revenue, earnings, estimates, and seasonality data. Simply enter a stock ticker and the Download Company Data for Excel downloads the data. This Excel add-in also utilizes an embedded 'LinkBuilder' functionality which provides you with context sensitive navigation to over 250 destination points on the internet.